In the winters, we humans like to cuddle up and ‘hibernate like a bear’. Bears in the wild actually DO innately curl up and go to sleep for approximately 8 months! Human beings know how terrible we feel when we lose sleep, but can you possibly imagine what it would be like to be robbed of a good night’s sleep for 30 years?!? If Fifi the bear could speak, she would tell you about the terrible impact of this loss. As a cub, Fifi was purchased by the Pennsylvania roadside zoo. 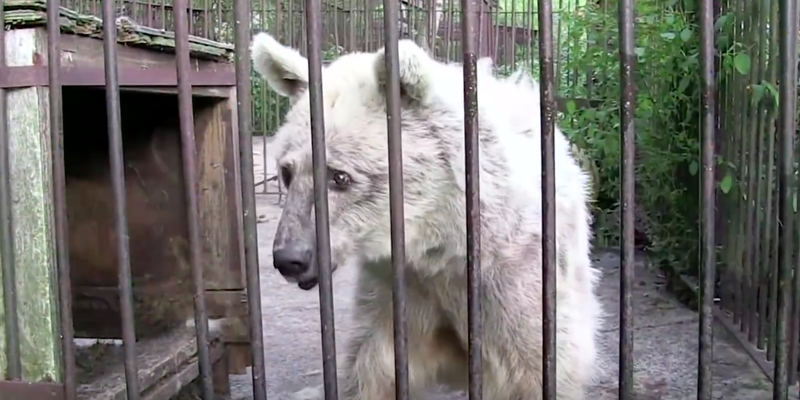 Forced to perform tricks for their shows for the first 10 years of her life, Fifi further suffered when the zoo would close, as they left her caged in a minuscule, rusty cage for over 20 years! Fiji’s horrible neglect and torturous existence ended in July of 2015, thanks to the rescue by PETA and The Wild Animal Sanctuary. Robbed of her natural need to hibernate due to her imprisonment in that tiny cage for over 20 years, they found Fifi in a very deteriorated condition, with untreated arthritis. Her condition was so bad that they had doubts about whether she would be able to regain a strong, healthy state. As you will see in the video below, Fifi’s rescue did allow her to slowly improve…after five months at the sanctuary, you will witness what the miracle of good and loving care, will render. Enjoy this wonderful story of recovery, and finally what a good sleep can do…Fifi is just awakening from her 30 year wait for a winter of hibernation in her cozy den!